This summer I read one book...Julia Child's "My Life in France". I know, I know...a lousy showing for an entire summer, but we were kind of in the middle of this little project :) Reading about the making of "Mastering the Art of French Cooking" was an amazing experience, especially since I could relate to many of the cultural differences she observed while in France. Given my own love of food and of cooking, I was truly captivated. You know what else is captivating? Not spending $8 on crème fraiche at the grocery store and making it yourself for about $1.50. Thank you Julia! She really figured out everything during those six years in France, including solving what is often a frustrating situation for me (I love crème fraiche but that price tag kills me every time). Now I can make this pie, this casserole, and this soup guilt-free and on a much more reasonable budget. I've shared the "how-to", per Julia Child, in my latest post for Cafe Zupas. View it here. This is my favorite cooking-related discovery in months! My sister just made some creme fraiche from scratch for me and it was amazing!! In sweden they sold it in different flavors, both savory + sweet. Oh, it was amazing! Does it really cost 8$ in the U.S.? I lived in Kentucky for almost a year during university-time, but I can't remember that! In Germany you pay something around 1, 50 $ for a cup. Thank you! This is so helpful. I made three very yummy recipes with creme fraiche last week for the first time and was gobsmacked by the price for a very small tin. This will make these recipes much more affordable! I love your milk bottle and yoghurt pot. This doesn't seem too far off from how I make yoghurt, so I will definitely be giving it a try. i'm so glad you shared this recipe. i was just about to buy some too. any good recipes to share using creme fraiche? That recipe looks amazingly easy! I'm so excited to be able to make my own. And I have to say that I covet your yogurt crock. Love it. do you use a thermometer to make sure the temp is good or is it okay to eyeball it? That is, will the whole thing fall to pieces if it gets one degree too warm? Bombini, my local fine foods store charges $7.99. Crazy, I know. It's so cheap in France! Caroline, check out the links in this post or the one on Zupas. I have links to Chicken with Morels, a Bittersweet Chocolate Pie with Creme Fraiche topping, etc. Yum! katik, I bought the yogurt pot in the US, in San Francisco at the Farmer's Market in the Ferry Building. A French man sells his yogurt there in those pots. Meghan, I test the mixture with my finger. Allysha, I think salt pork cut up in small pieces makes decent lardons. Hey, I hope you got to see the movie "Julie and Julia". Amy Adams and Meryl Streep did a great job in it...I think it's on video now....at least it was on TV. I'm sure you would relate! Hallelujah. This will change my life. 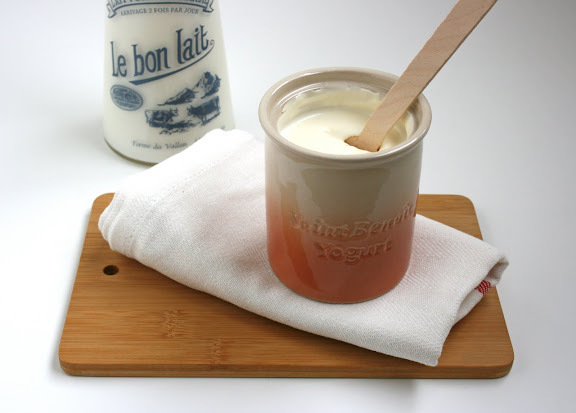 That is my friend, Benoît's yogurt, so cool to see it on here! am looking forward to reading My Life in France. I've started using creme fraiche on meat-centered latin american dishes like arepas (like at http://www.picapicakitchen.com/). Can't believe how good it is. mmmm. This is so helpful! I can never bring myself to buy creme fraiche, but it's so divine!